I have had a grand total of nine ‘first days’ at school. Some are just a fog of teachers’ names, confusing rules and long corridors, others form some of my most vivid memories. Arizona 2008, Canyon Springs Elementary school in the scorching heat. Crouched under my desk peeking at the desert though the barred windows. A siren was screeching as the doors slammed shut and all the security grilles locked to the ground. My new teacher, crammed into the stationary cabinet, warned us not to move an inch or make a sound. I was eight and presumed this was the standard daily American school drill, along with reciting the Pledge of Allegiance. Later, I discovered that there had been an intruder roaming the school with a 10-gauge shotgun. My parents removed me shortly afterwards. South Carolina 2010, Low Country Prep School, located near marsh land infested with alligators. 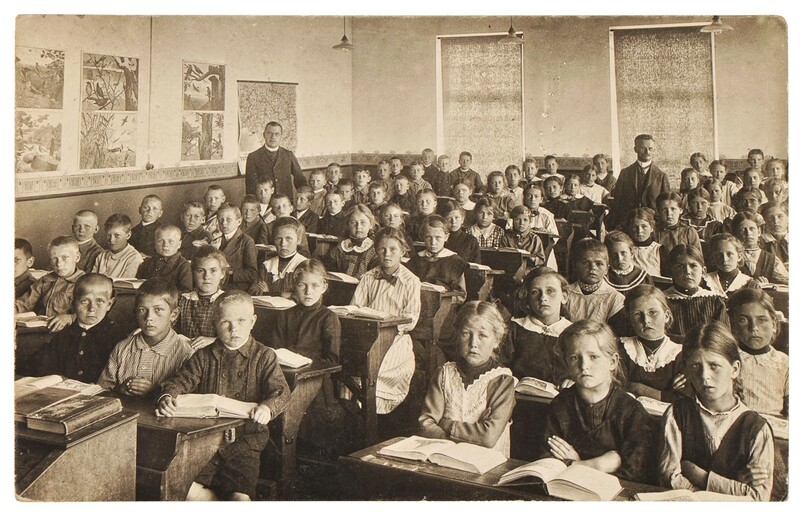 My class consisted of 16 pupils and our daily routine of watering the class plants and rotating library duties became a gentle formality, along with lessons on the beach and Easter picnics. Our school trips included aquarium adventures, scavenger hunts and regular McFlurry pit-stops. Once a month the school would gather in the gymnasium to engage in what was known as a “pep-rally”, with inter-year screaming competitions, flash mobs and a lengthy performance from the over-enthusiastic cheerleaders. Parents were heavily involved in school activities, they took part in charity fundraisers and drove students to countless science fairs and spelling bees. I was heartbroken to leave. Devon, England, 2012. I was eleven. I walked into a building resembling Hogwarts and was stunned by the smell of ageing hymn books and dusty brass organ pipes. The other girls glided up the steps in their full-length kilts as I just managed to prevent myself from face planting onto the stone floor. That same day I was thrust onto my first netball court and told to play ‘wing attack’, whatever that was. The hour consisted of leaping, snatching and total confusion – why was everyone screaming when I ran with the ball? Buckinghamshire 2013. My ninth and current school) and my ninth first day. I remember noise. Being surrounded by thousands of people as I walked down the crowded corridor towards my tutor room. It reminded me of a London tube station at rush hour. My initial anxiety at the sight of the police car parked outside reception only increased as two menacing year 11 boys walked towards me and the feeling of impending doom remained with me for weeks. Even now, four years later as I enter Year 13 (Upper Sixth), the sound of yelling and rushing onlookers makes me highly nervous. So, what have I learnt from these experiences? Other than the fact that I cannot play netball, I’ve learnt to appreciate different cultures and traditions, to respect personality differences and to create a good first impression. All of these are qualities that will help me later in life when moving into university or applying for a job, as they have given me the communication skills to interact with all kinds of people and handle changes in life. I have navigated the waters of transition in different cultures and countries, and to be perfectly honest, it doesn’t get much easier with time or experience. I can’t pretend to know all the answers about how to survive school; the friendship dramas, the cafeteria stampedes, or the scary teachers. However, I can offer a few suggestions for students adjusting to change and also tips for teachers dealing with new students. First impressions matter: I’m sure you’ll hear that from everyone but it really is true. Your first piece of homework, the first friend you make, the first contribution in class will all create a profile for how other students (and teachers) view you. Try to be polite and be yourself. Friends or “Friends”: Choose your friends wisely. You don't want to end up in “that” group who are notoriously known for their unnecessary drama and consistent relationship problems. Don't be afraid to wait for the right people instead of befriending the first person who talks to you. In the same boat: If you are struggling with the work load, getting lost around the school campus or just feeling lonely you HAVE to tell someone! It’s no use putting on a brave face and fooling everyone into thinking you're completely fine just to seem as cool as everyone else. I guarantee that there are other people who feel exactly the same way. Start how you intend to carry on: It can be hard to stay organised and on top of things, especially in sixth form when given so much new freedom, but it’s important to start as you mean to go on. This doesn't mean lengthy essay notes or extreme colour coding, but simply having designated folders for each subject and making sure that you have notes that will make sense to you when coming back to revise from them. Relax: if you feel yourself falling into a pit of panic and stress about the situation, make sure you have activities that you know are relaxing for you (for me it’s painting, music or yoga). Don't pile on the work: We know you want us to start the year well, but from experience I can say that piling on the work in the first few weeks is not helpful to students, who can become demotivated or stressed due to unrealistic aims of completing it all. Increase workload gradually instead. Group work: You have no idea how much tension can be caused when you say, ‘just get into groups’. It starts all sorts of power play and bullying by exclusion. Please assign specific groups and don’t let students pick their own (mostly for younger years). Even if everyone complains, most people are secretly pleased. Praise: Very simple but also very effective, every student wants the approval of their teacher and public congratulation can be extremely motivating. Be available: Students will feel much more confident in knowing that you are around to answer their questions and encourage them in their studies. Have a specific time for students to drop in to ask questions. Lesson variations: We know teaching is hard work. But simple things such as introducing hands-on activities into lessons can make the content interesting and memorable for students when trying to recall information for the exam after two years. We are even harder work when bored! Izzy is 17, and studying for A-levels in Buckinghamshire. Dont forget to nominate a school, teacher or student for a National Happiness Award 2017. There are over £5000 worth of prizes to be won for the winners and runners up. The awards also receive national coverage which helps to raise the profile of your school and puts wellbeing and happiness at the heart of your curriculum. Nominations close at midnight on Friday, 20th October. Winners and runners up will receive their prizes at a happiness-studded ceremony in London on Friday, 17th November. Don't delay - vote today!